Netgear has a couple of interesting consumer products-related announcements at CES 2019 – one related to their cable modem lineup, and the other related to the Armor cybersecurity service offering. 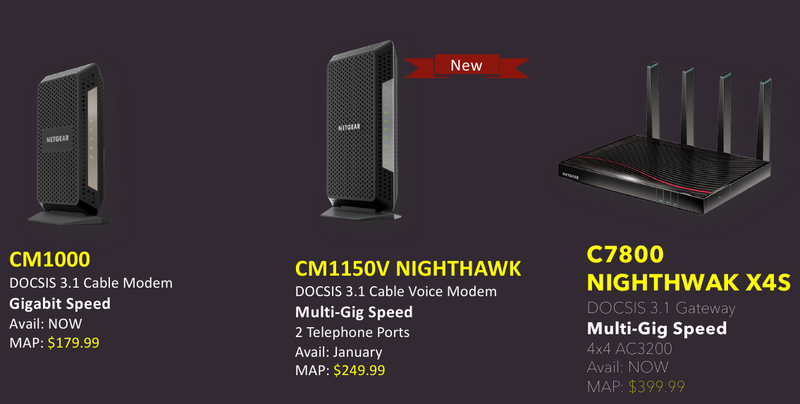 The new CM1150V Nighthawk is a DOCSIS 3.1 cable voice modem, and is very similar to the CM1100, except for the addition of two telephone ports. As the RAX80 takes off in the market, the new CM1150V (and the CM1100) can turn out to be excellent complementary additions. The CM1150V will be available later this month for $250. The product joins the two other non-exclusive ones in Netgear's DOCSIS 3.1 lineup – the CM1000 cable modem, and the C7800 Nighthawk X4S DOCSIS 3.1 gateway.